For over 15 years chance has developed and presented Storm Fury on the Plains to educate and train emergency managers, and volunteers on severe weather and storm spotting. Chance has a passion for forming relationships and building cooperation among all players for a better warning process to the people, we serve. Jamie is completing his first year as USD 220 Superintendent, and Principal of Ashland High School. When the Starbuck fire started and was overtaking Clark County, Jamie quickly volunteered Ashland High as a shelter location for wildfire evacuees in Clark County even though school was still in session. Mr Wetig and his staff exceeded all expectations running a shelter. The team has taken extensive training through the American Red Cross to aid the victims of disaster, provided snacks and beverages to the responders and assisted in sheltering services. Hans Stephensen has instructed Homeland Security Exercise and Evaluation Program, K-132 Class- Discussion Based Exercise along with K-133 - Class Operations Based Exercise. Exercise design is a tough task and these classes provide a lot of information in a short period of time. Hans takes the time to check in with students to ensure that they are understanding the material and answers questions as they arise even outside of the classroom. His critiques always come in a constructive manner and provide encouragement to give the learner a boost of confidence in a stressful situation. He provides information that is traditionally dry in an easy to digest way. Providing personal examples in the classroom and bringing humor in at appropriate times. He is responsive to his fellow Instructors and students when they provide additional discussion. Even when the class has ended and students return to work, the teaching does not end. He never stops trying to help others learn. Director Fell hit the ground running when he started his position on February 7, 2016 immediately reaching out to introduce himself and engage community leaders, local planning committees, public and private sector community partners and volunteer organizations with the goal of enhancing community preparedness through relationships and partnerships. He strives to make timely and accurate information available to the public by fostering relationships with local media and through the use of social media. Due to his hard work and dedication he has energized and revitalized Lyon County Emergency Management, LEPC, and the local COAD by attracting new members through exercise and training activities based on community risk and common purpose. He is good at following up and staying the course and is eager to help and learn. Director Fell responded to the Greenwood County tornado in Eureka in 2016, Barber County wild fires in 2016 and the Reno County wild fires in 2017. In July of 2017 he led the response and recovery efforts for a Lyon County water main rupture, which left residents of Emporia and surrounding areas without water on one of the hottest days of the year. Jarrod Fell embodies values and leadership that inspire others to excel. 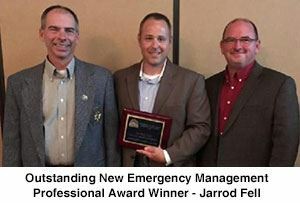 He develops and implements new highly effective and creative programs and activities and exhibits dedication to the betterment of the Emergency Management field in the State of Kansas. During the Starbucks fire in Clark County, Millie did an outstanding job of coordinating the fire response. 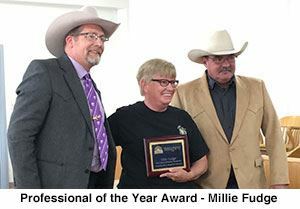 Because of Millie’s diligent efforts, Clark county emergency operations center was able to provide excellent resource tracking and accountability to the IMT when they arrived to assist. The continued recovery efforts are going much more smoothly due to her hard work. Pam was a member of KEMA when Moses was the president of the group (since 1992). Pam has worked tirelessly in serving the emergency management profession in the state of Kansas. Pam has served on every committee and working group out there; EMS, IMT, Homeland Security, and is still on most of them. Pam not only serves on the committees but usually as chair, or vice chair, or secretary. The job never matters just that she is able to help in some way. Pam has served KEMA as North Central Vice President for at least 8 years and is the go to person in the North Central Region for all things Emergency Management and exercise related. Don has been a KEMA member for a very long time. Don was a valuable asset to KEMA, the KEMA conferences, and his colleagues in the North Central Region. Don mentored several new EMs over the past 10-15 years. He retired several years ago from Jewell County and came out of retirement to help Osborne County revamp their Emergency Management program. Don was active in the North Central Regional Council and was active in KDEM Trainings and local and regional exercises. 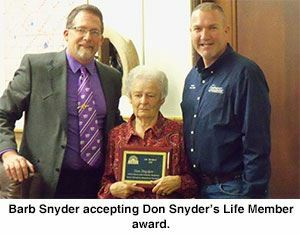 Don Snyder will be greatly missed.